Dozens of the top guys in tourism in one place and as Tilma Group's intern I got to schmooze and ask lots of questions (Anyone who meets me, remembers this quality about me; I'm very curious). If you ever wondered if you were in the right industry, stop wondering! Minister for Tourism, Hon Kate Jones, says there will be 20,000 new jobs in tourism in Qld in the next 4 years! Tourism employs a million Aussies – 1 in 10 of Qlders (mining is much less), and every 10 backpackers create 1 job in Outback Australia. 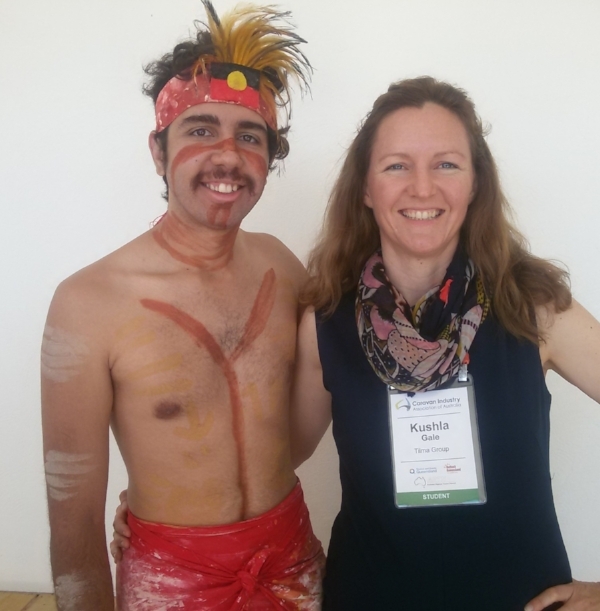 How was it to be an intern at the Australian Regional Tourism Network's national convention? It was an open door to the tourism industry at all levels and specialities. I'm very grateful to Linda Tillman for taking me along for the ride, introducing me to many of her friends/ regional tourism champions. Spend time with those who can teach you something. It was amazing to have contact with professionals from the biggest tourism associations in Australia, sitting on a straw bale with tea and scones; having access to destination managers to ask them about their career paths and skill sets. 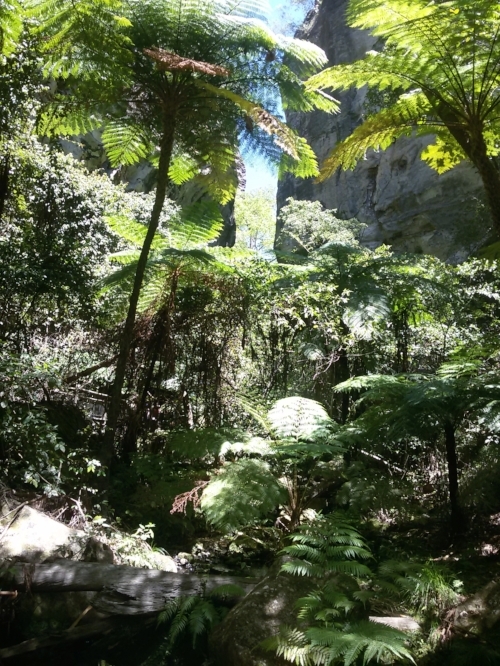 Photos: A visit to Carnarvon Gorge with delegates - ticked that off my local bucket list! My take-outs reflect my newness to the industry (well, many years on the front lines of tourism in the US and Europe, but none in a professional role in destination management and marketing). There will be a billion more trips each year. People will take 1,000 flights in a lifetime, will have multiple income streams, take breaks in their ‘careers’, will have location-independent work so they can live in regional areas. There will be devices customised to your preferences, the internet of things, driverless cars (1 in 4 sold in 2025), chatbots, wearable tech, augmented and virtual reality, 3D printing, gesture-directed tech,androbotics, so customers crave human contact. The climate is going to be weird. Trends: bucket lists, health travel, mystery travel (spiritual connection, engagement, authenticity, indigenous), educational travel, extended stays to immerse in local culture. Audit your community’s resources. What can be reused? feel there’s not enough demand. Mining and agriculture are big businesses. Though tourism has the same impact, with many small businesses, the industry is not as visible to politicians. The tourism industry needs to speak with one voice. Get in the face of your local representative and advocate for your interests via social media, petition, directly. Farmers do this well. How do you get innovators to move to your region? How do you reinvigorate an attraction? The most tweeted regions are rural. Preserve and sell your wide, open spaces, night skies, natural wonders; tourism as an STEM educational tool; link with research facilities. Increase emotional intensity in interactions with people, help them create their own souvenir, cocreating their experience, connecting with their reason for traveling, discover what’s important about a place and why a visitor should feel passion for it. Only 20% of visitors go to attractions. Social interactions such as dinner, or nature experiences are more popular. 10% of global spend is influenced by Tripadvisor. Visitors to the site read the first two pages of reviews. Chinese are downloading destination guides in Chinese for offline use. For Tripadvisor to create a destination guide, there must be a certain number of attractions, restaurants and accommodations listed in the region. Aussies spend the most per person per trip in the world and take more than one trip per year. 47% enjoy cultural activities, and 21% buy because of special deals. Visitor numbers: When do they come - seasonal demand and by month and by day of week. Ask yourself – why does no one come on a Tuesday [your slow day/time]? Collect email addresses for after-visit surveys on key issues. Add prizes. Remind them they stayed with you. Offer the info to your local paper as a monthly story in the local press – give some facts and analysis. Remind your community that tourism is everyone’s business. A tourism marketing agency owner took me through her process of taking a customer through a marketing plan, beginning with a situational analysis, to creation of ideal customer personas, a SWOT analysis, product analysis, competitor analysis, the product’s elevator pitch, an audit of the customer journey, and finally a marketing action plan. I had hoped that my tourism degree would have left me with a firm grasp of such a process. Presentation skills are important! Package facts into a story like Young Tourism Professional winner did when she described the details of a roadtrip in the past, present and two future scenarios. Don’t write a speech and read it – know your subject and talk from your slides. Provide PowerPoint slides for difficult concepts so your audience can follow what you are sharing. I'd highly recommend the Australian Regional Tourism Network as a place for incredible networking, and a font of idea-sharing and inspiration. Read Linda Tillman's blog post about her learnings from the convention, too, for a totally different perspective. 2016 State Tourism Award Winners!